This page is dedicated to all gourmets, fans of Romagna cuisine. We decided to include some recipes of the Romagna tradition, hiding it from the secret recipe book of the legendary Mrs. Nucci, the cook who has been delighting the guests of Hotel Boston for over 35 years with her delicacies. The recipes are made with fresh and genuine ingredients, do not contain any kind of additive or preservative and above all they are very tasty and tasty. And above all they are the same dishes that you will eat at the Hotel Boston in Cattolica! Some require a little 'preparation others are easy to cook and sure to succeed for your guests! of flour, 300g of Parmigiano Reggiano cheese, 200g of pork pulp, 200g of San Daniele ham (or alternatively mortadella), 100g of Chicken breast, Chicken broth (or capon) without added nut, 50g of butter, 5 eggs, olive oil, pepper, nutmeg, grated lemon peel, salt. vertical, in order to obtain squares of 3 - 4 cm. from the side. Place a small filling in the center of the square and fold the sheet into a triangle making all the edges adhere well. After having tightened the two sides of the triangle between the thumb and forefinger of both hands, rotate the small caps around the tip of the left index finger with the right and overlap the two corners, compressing them until they are perfectly joined. 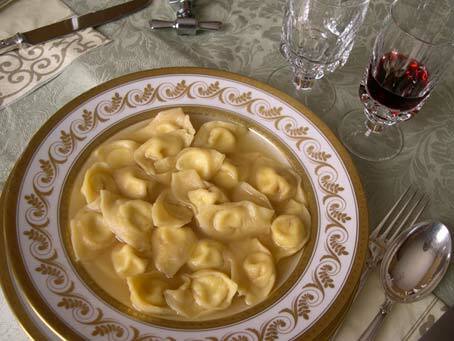 The cappelletti must rest and firm for at least 24 hours, then cook in the capon broth for a few minutes (depending on the consistency of the pastry). Serve with plenty of stock and add Parmesan at will. Prepare the broth adding to the water onion, celery, carrot, a ripe tomato and the fish available, boil for about an hour. Meanwhile prepare the passatelli with breadcrumbs and grated Parmesan, add a tablespoon of flour, salt, nutmeg and grated lemon zest, mix everything with an egg. Then press the mixture obtained through the holes in the iron for passatelli or in the absence of this one of a potato masher (which usually however has wider holes). Then cut the strips obtained in some segments of a few centimeters in length, then cook everything in the fish broth appropriately past. Serve hot. 4 minutes. Meanwhile, prepare the sauce, stirring in a pan onion, celery and carrot properly chopped, once the onion is browned add the sausage and mash it directly in the pan with a fork (important!). Add a splash of white wine as soon as the sausage arrives at proper cooking, let it settle for a few seconds then add the tomato, salt and pepper, keeping the fire very low. Cook until it thickens. 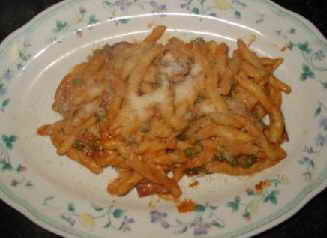 Serve the strozzapreti hot with the sauce poured directly into the dishes (do not skip the strozzapreti with the sauce!) And a sprinkling of Parmesan. Ingredients: 500gr. of cornmeal, 250 gr. wheat flour type 0, a pinch of salt, parmesan, for seasoning: meat sauce or beans with sauce. Mix the two types of flour with hot water and a pinch of salt to make a soft and velvety dough. Form a sheet about 3 mm high, flour it, roll it up, and cut it into small squares about 1 cm. Cook the small squares in salted water for 5 minutes, drain and dress with meat sauce and parmesan. 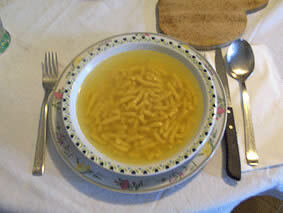 Alternatively you can prepare cooked in broth with beans in the sauce. This dish is presented with two variations of seasoning: the meat sauce and the bean sauce. In both cases, due to the complementarity of its ingredients, it should be considered a single dish. It is to be consumed without adding the dish as both meat and beans are protein foods even if of different origins. 500 gr. of flour, 4 spoons of lard or lard and lard, warm water, salt. Arrange the flour on the cutting board, place the fat in the middle, pour the water, salt and knead. Work everything for a few minutes, until a soft dough is obtained and divide into loaves large as a punch. Roll them out with a rolling pin, obtaining round and thin "moons". Cook the piadas on the hot pan, making sure to roll them with the tip of a fork and turn them often. The lard can be replaced with extra virgin olive oil (in the dose of 10 spoons for 500 gr of flour). The piada must be cooked at a high temperature, taking care not to burn the surface. The piada was prepared in all the houses almost every day and was a bread that accompanied different dishes: beans, country herbs, bacon, fish. 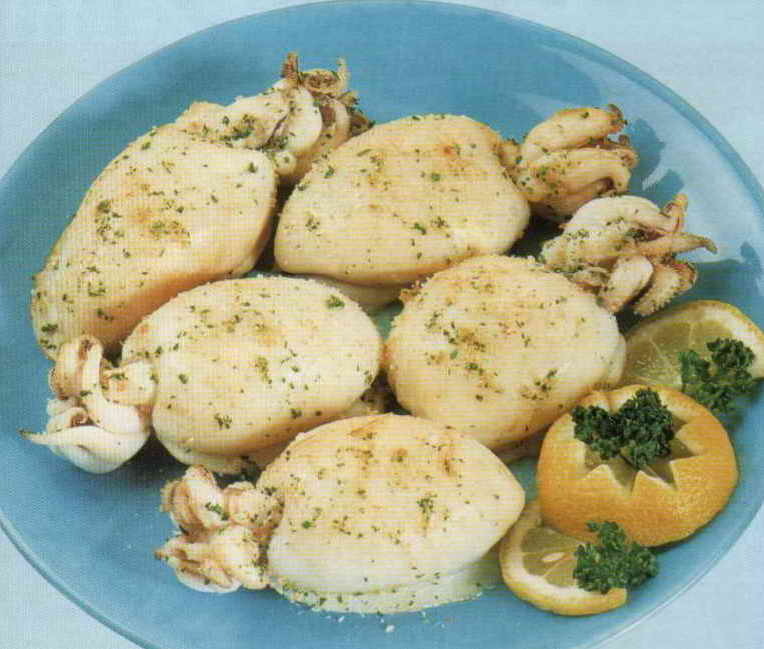 Black cuttlefish from 100g each, breadcrumbs, garlic, parsley, capers, anchovies in oil, extra virgin olive oil, salt. Clean the cuttlefish by cutting the belly with scissors and leaving the bone attached. Prepare a filling of bread crumbs, garlic, parsley, minced capers, chopped anchovies, salt and olive oil. Stuff the cuttlefish with the filling by adding the tentacles and finely chopped heads to the dough, close with a skewer taking care to fix the slit several times. Grease with oil, add a sprinkling of bread crumbs (a little!) And parsley, then cook slowly on the grill on embers not too much alive, or in a hot oven at 180 degrees. Serve hot. 300g of flour, two eggs, 50g of butter, 50g of sugar, two tablespoons of Rhum (to taste), lemon, salt, olive oil. Mix flour, sugar, eggs, grated lemon peel, butter and rum; let the dough rest for 30 minutes and then roll it out with a thickness of 2 mm; cut it with a toothed washer in strips of 15 × 4 cm; fry in boiling olive oil until complete browning; leave to dry on absorbent yellow paper and serve hot sprinkled with icing sugar. (for 8 people): 500g of sifted flour, three whole eggs and one egg yolk, 180g of fine sugar, 100g of butter, a grated lemon peel, 1 dl of milk, 15g of tartar cream, 5g of sodium bicarbonate. buttered by molding it into an oblong shape. Brush the surface of the donut with the egg yolk and cover it with the sugars. Put the pan in the oven at 180 degrees for 30 minutes. Allow to cool before serving.